During 2009 & 2010, Friends of the Eastern Promenade collaborated with Portland Trails and the City of Portland to build two important trail connections, located on either end of the Eastern Promenade. Construction of these trails provides both a complete trail network encircling the Promenade as well as critical shortcuts and links to destinations beyond, including Back Cove, Bayside, and the Old Port. Fort Allen Trail's 82 granite steps link the southeastern corner of Fort Allen Park to the lower paved trail below. 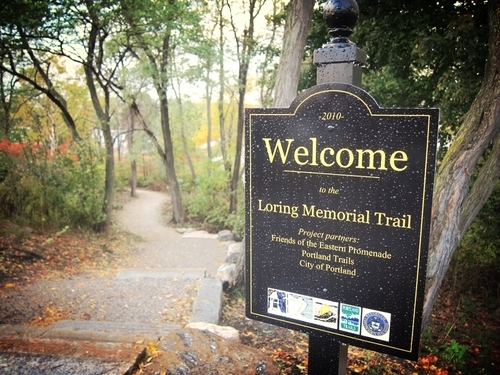 Loring Memorial Trail is accessed at the northwest corner of Eastern Promenade road and links the mid-slope trail down to the Bayside Trail and Eastern Promenade Trail below, through a series of granite steps and dirt paths amidst cascading trees, wild plants, and other sun-sheltering foliage.